After the Christmas decorations come down, it’s hard to not miss the red, green and gold colours that were in the house. Fortunately Chinese New Year and Valentine’s Day are just around the corner. We have a large, cut paper heart from Denmark that we use for decorating at Christmas time. Since it is heart-shaped, we keep it out for Valentine’s Day as well. 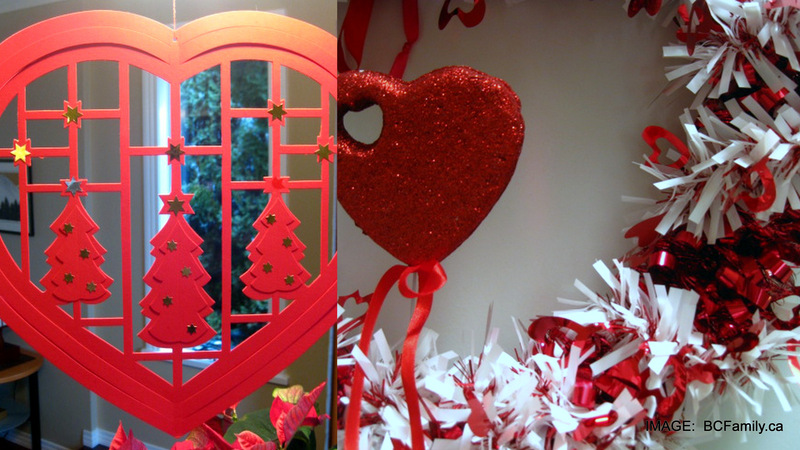 This year we decided to keep the Christmas wreath door holder out and make a Valentine’s Day wreath. Instead of placing it on the outside of our front door, it’s hanging on the entrance to our garage door so that we can enjoy it every day. If you would like to make a wreath, you could go all out at the local craft store buying supplies. You could also use supplies you have at home or make a trip to a local dollar store. This wreath is made using a wire Valentine’s wreath wrapped in a textured red garland. You could look around your home to see what you can use for a heart base. A large piece of cardboard could be cut into a thin heart, wide enough to support the weight of the garland. You could twist a dry cleaner hanger into a heart. Or you could look in the craft store to see if you could find a styrofoam heart to wrap. The base doesn’t have to look pretty or be too exact as it will be covered up. A second white garland, with a garland of individual hearts wrapped around it, was wrapped around the red wreath. Space was left so that the red wreath could show through. For the garland you could look to see if you have any left over Christmas garlands in red and gold that you could use, or check out the supplies in your local dollar store. A styrofoam heart painted in sparkly red paint and mounted on a white wire was inserted into the base of the heart. A thin, dark pink ribbon was layered and tied at the top to make a pretty bow. The heart at the base could be made out of any material. You could make it out of paper and add layers, decoupage style, to create a three dimensional heart. If you don’t have a wire on hand, you could wrap two pieces of pipe cleaner together to make a strong base. 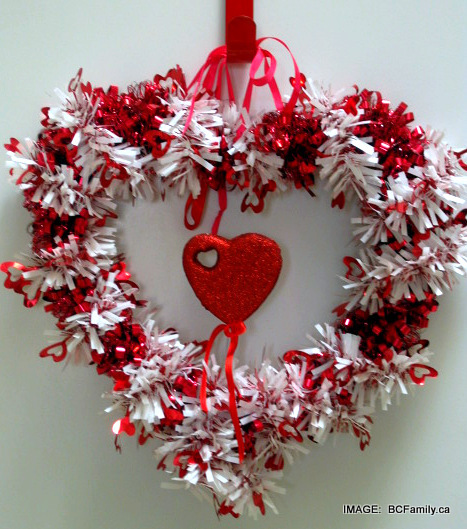 Have you made a Valentine’s wreath at your house? If you have a photo on Twitpic, Flickr, your blog or a public photo page, you could share a link in the comment section below. You can comment about this posting using the comment function below or by visiting the BC Family Facebook page. Your opinion matters so don’t be shy!